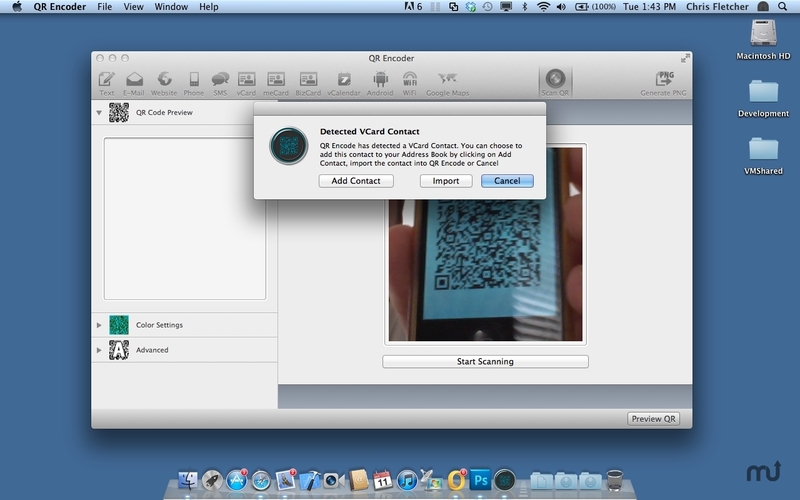 Scan QR Codes on your Mac. Is there a better alternative to QR Encode? Is QR Encode really the best app in Applications category? Will QR Encode work good on macOS 10.13.4? QR Encode is a QR code generator that makes creating QR codes a snap. Select the QR code you wish to create, fill in the information and click on preview. Bug Fix: Fixed App crashing on startup when there is no capture device available. QR Encode needs a rating. Be the first to rate this app and get the discussion started! QR Encode supports exporting your code in either PNG or EPS format. QR Encode also supports full screen mode in OS X 10.7 Lion. QR Encode uses an embedded Google Map to help you easily and interactively search for locations to encode within your QR code. Additional features also allow you to change the foreground and the background color of the QR code as well as setting the size and the quality of the QR code.